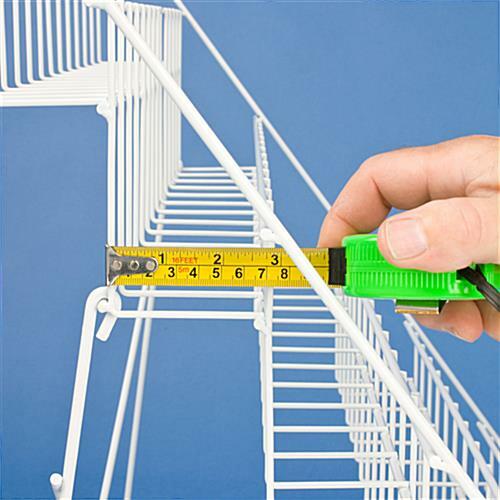 2-1/2"d Pockets provide a large storage capacity. Front sign channel for a custom advertisement printed on an 18"w x 2-1/2"h insert. 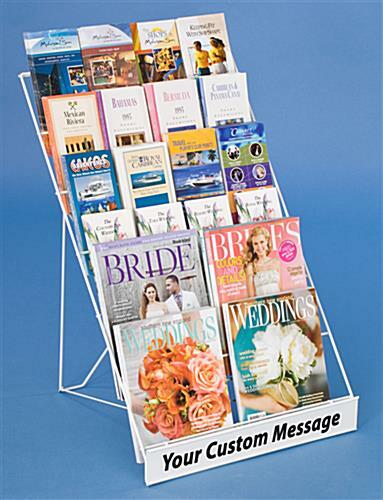 This white magazine rack holds many types of pamphlets. This countertop stand has six pockets arranged in a "tiered" or "step" configuration. 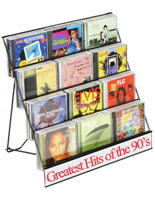 There are many advantages to a 6-tier white magazine rack when compared to traditional units. 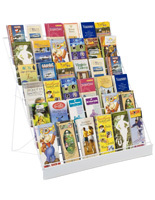 First, this pamphlet stand provides a significant amount of storage capacity while taking up minimal space. 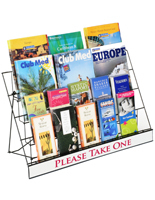 Second, the 6-tier design allows customers to view brochures displayed on each row. This white magazine rack features pockets with no dividers. Each row holds (4) 4"x9" brochures or (2) 8-1/2"x 11" magazines, allowing the display of a custom arrangement of reading material. 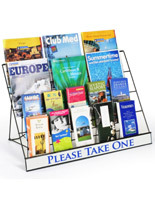 Each literature holder, white magazine rack has an 18"w x 2-1/2"h sign channel located at the base of the display. The channel is designed for displaying custom advertisements printed on an 18"w x 2-1/2"h piece of paper. Inserts slide into position along the channel grooves and do not require tape to say in position. 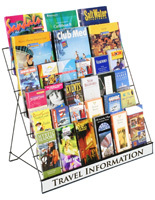 The capability to advertise with a custom sign make these countertop brochure stands more effective at capturing customers' interest than a generic unit, without a sign frame. 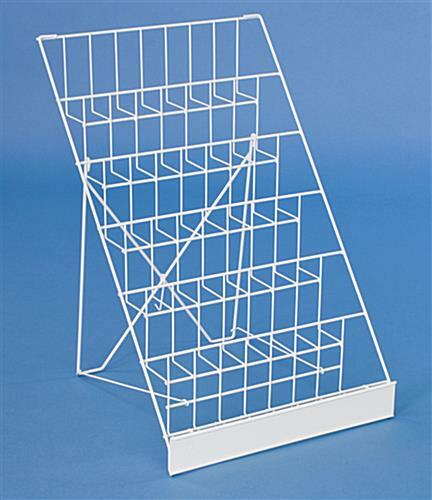 The white finish of each magazine rack enables it to coordinate seamlessly with any setting. 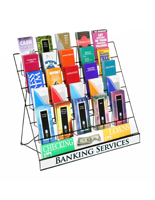 These countertop brochure stands are manufactured from steel wire. Each unit is portable, as it is lightweight and the back support folds down. The sign plate of each unit is fabricated from metal as well! 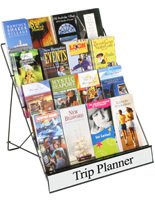 These brochure racks will last longer than many plastic or wooden units. 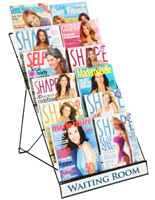 The combination of a 6-tier design, durable construction, and affordable price makes this white magazine rack an incredible value. Please Note: A custom insert is not included for the bottom, white background sign channel. 18.0" x 25.0" x 17.5"
17.5" x 5.5" x 2.5"
I bought three 18" wide racks. Things I like: • lightweight • foldable • easy to use • slot for sign at bottom • great price My photo shows these racks filled with 8x10 prints. I would put no more than three 8x10's vertically and not more than two horizontally to still see enough of each print to encourage a closer look. I used the racks for an outdoor fair and tied string across each rack to prevent work from blowing away and the work was secure. My set-up time was super-fast! Things we like: This review! Thank you Miriam for your review and your prints look great. Posted one year ago by Miriam Martincic M.
I am an author, and this is PERFECT for my paperbacks to be displayed at signings!!!! I use it to display art prints and it works great. Just how I imagined it! I bought this because of the price. What I didn't anticipate was just how sturdy and easy to use it'd be. It's very large but I'll take a thing being large over being slightly more difficult to store and travel with. It's a dream come true for cons though. Price can't be beat. If you find it cheaper anywhere else I'd be amazed and suspicious. Thank you for the great review, Melissa! Your display looks great. Thank you for shopping with us! I design and make paper craft kits and sell them at craft shows. I got this rack because it's lightweight and folds up, both of which are useful when my entire "store" has to load into my small car, into the venue, and then back into my car in a few hours. This is actually my second purchase of this item - I liked the first one so much that I bought a second one to give me more options when I set up my display. Thank you for your feedback, Abigail, and thank you for your repeat business! We hope to hear from you again soon.